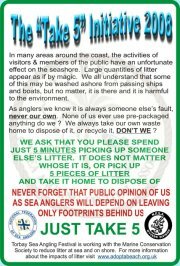 The Tope (Prohibition of Fishing) Order 2008 comes into force on Sunday 6th April 2008. It allows fisheries officers to board and search boats suspected of killing tope.While anglers will still be allowed to pursue the fish using rod and line, new laws say any that they catch must be returned to the water alive.As part of a programme to protect a threatened species, recent Government legislation has put severe controls on the catching of Tope in England. Effective from 6 April 2008 anglers will only be able to catch Tope on a catch and release basis. Under no circumstances will Anglers be allowed to retain Tope, whether to eat or for specimen or record purposes. This legislation may also expand to smoothounds later in the year. Saturday 26th April - Dartmouth Plaice Festival - Day 1 - A light Southerly wind with sunshine and calm seas saw 144 competitors sign on for today. about 50 boats fished the "Skerries" which are about 4 miles out to sea from Dartmouth.The fish were there in abundance, though not of great average size. Many of the Plaice caught and returned alive were between 1 lb and 1� lbs. Best fish of the first day was a Plaice of 3 lbs 7 ozs, caught by Mark Ash from Plymouth,aboard a Plymouth charter boat, "Sea Angler II". Paignton SAA member Mike Johnson had a fine plaice which was recorded at 2lb 12oz 5dr,fishing from Tim Birds boat 'Otter'. Also Paignton SAA Junior Liam Cosgrave had a plaice of 1lb 13ozs. Photo & Info Courtesy of Mike Concannon. Sunday 27th April - Dartmouth - Plaice Festival - Day 2 - A South West wind around 13 mph, interspersed with some misty showers produced fishable conditions from boat and shore. There were some fine Plaice weighed-in this evening. lbs 10 ozs, both from the "Skerries", to take first prize with a combined weight of 6 lbs 7 ozs 8 dr.
Juniors: 1st Dominic Ruskin - who won a Storm fishing rod. 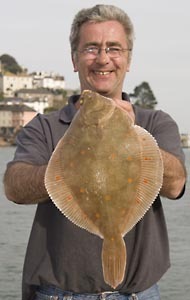 Best Plaice Sunday - 3 lbs 14 ozs - Chris Cheslett from Redruth - �180 sweep. NFSA Wyvern Division News - Dates for Wyvern Open Events - Wyvern Junior Open will be held at Teignmouth on Sunday 17th August 2008. Wyvern Small Boat Open will be held at Salcombe on Saturday 13th & Sunday 14th September 2008. NFSA Wyvern Division News - Berry Head Clean Up 8 am 1st June 2008 - The members of NFSA Wyvern Division, together with any other folks who might like to join them for this important event will be picking up litter at Berry Head, Brixham, between 8 am and 11 am on Sunday 1st June 2008. 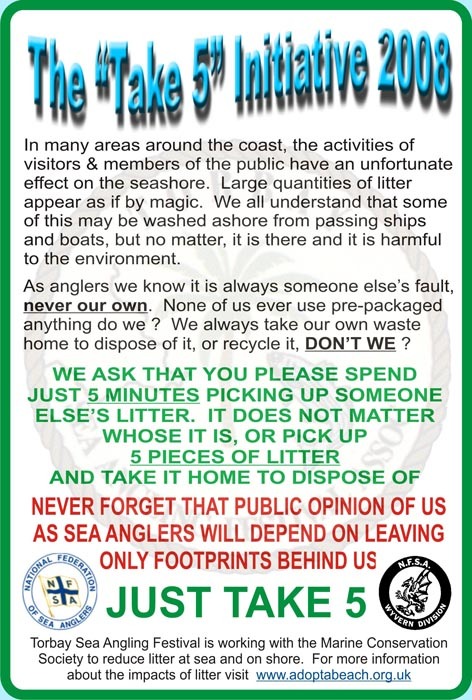 Please write this date in your diary now, and let's get a really good attendance by concerned recreational sea anglers to help. Please be there.